The Strip is the zone that brings together the most thrilling and vibrant attractions in Las Vegas. "Excitement and energy" are the perfect words to describe this fascinating destination. Find out more about it here. When you hear the name Las Vegas, the first thing that springs to mind are the casinos, where gambling is king. Gambling began in Las Vegas before the 1930s and was controlled by the mafia. Later, with the legalization of gambling, hotels were able to control casinos, which then became a vital part of the economy in this glittering city. Las Vegas has the perfect infrastructure, climate and atmosphere for business trips, family vacations, weddings, large events, sports and even luxurious spa getaways. When visiting this fascinating destination, don't miss out on the incredible Las Vegas Attractions, featuring the best entertainment in the world. The world's most famous wax museum can also be found here: Madame Tussaud's, featuring life-sized celebrity figures. You can show off a photo of yourself standing next to Michael Jackson, Lady Gaga, Elvis Presley or even Jack Sparrow from Pirates of the Caribbean. The nights in Las Vegas are out of this world. On Fremont Street, you'll find an immense combination of vintage art and cutting edge technology, with 12.5 million LED lights and exciting music. Here, you can experience live concerts and sporting events, creating a new and thrilling atmosphere every day. Along with the casinos, the hotels are without a doubt one of the top attractions in Las Vegas. The Bellagio is one of the city's top hotels, known for its famous Fountains of Bellagio, an unforgettable dancing fountain show set to music on a 10-acre lake. In addition to the fountains, you can also view the spectacular botanical gardens and museum at the Bellagio Conservatory, filled with walkways surrounded by lush plant life and artwork. If you want to feel like you're in Paris, visit the replica of the Eiffel Tower at Paris Las Vegas. On the upper part of the tower, you'll find an elegant restaurant where you can enjoy an incredible dinner with breathtaking city views. You'll also be able to see volcanic eruptions light up the sky every hour at The Mirage, experience a thrilling roller coaster ride at the New York New York Hotel and Casino, and see dangerous creatures in the Lion Habitat at the MGM Grand, where the only thing separating you from the lions is a glass wall. Get your adrenaline pumping at the Stratosphere Resort and Casino, featuring the tallest scenic tower in the United States. Here, you can choose between being shot 160 in the air at 45 mph on the "Big Shot" where you'll experience zero gravity, spin around from a tower 820 feet in the air on the "Insanity", or experience "X-Scream", a high-up teeter-totter whose every movement threatens to launch riders over the edge. If you can manage to keep your eyes open on any of these rides, you'll have an incredible view of Las Vegas. Families and nature lovers will find tons of fun options in Las Vegas. Shark Reef is a water park with more than 2,000 animals and 100 different species, while Secret Gardens and Dolphin Habitat allows you to get up close to exotic animals in their natural habitat. Showcase Mall, on the other hand, offers entertainment for all ages with a movie theater, GameWorks, The World of Coca Cola and M&M's World. At Siren's Cove, you'll see a live show combining sensuality, seduction, music and energy with pirates fighting beautiful mermaids! This city is not just about casinos, gambling and nightlife. 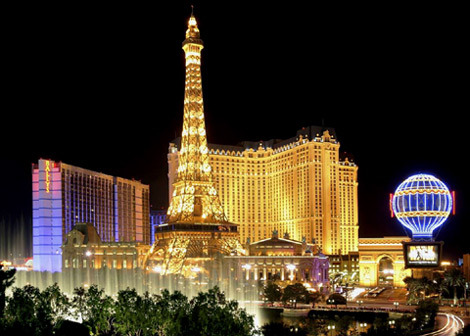 The Strip brings together the most thrilling and vibrant attractions in Las Vegas. "Excitement and energy" are the perfect words to describe this fascinating destination. Don't wait, book your next Las Vegas vacation today.